A Massachusetts urologist files a whistle-blower lawsuit against Steward Health Care, claiming that the venture capital-owned hospital operator not only pressured him to refer patients only within the health system, but also strong-armed his patients directly and cancelled their appointments his office had made for them at competing hospitals. Steward then terminated the surgical privileges of Stephen Zappala, MD, claiming his patient care was substandard. The company’s attorney said in a court hearing that policies intended to reduce network leakage are common, earning the judge’s contempt for using the “all the other kids are doing it” excuse. 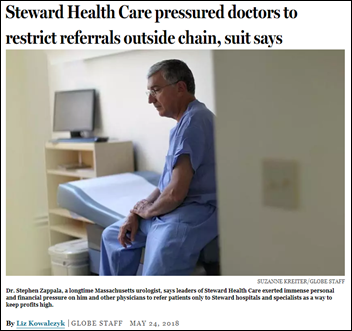 He argued that patients were not harmed since the the doctor sent them to the providers he felt were best for them, thus making his whistle-blower claims invalid. Cerberus Capital’s holdings, other than Steward, include the Albertsons grocery chain, Staples, Avon, and defense contractor DynCorp. From Tracking Man: “Re: Awarepoint. The RTLS company has apparently shut down operations. The website is down.” I can only verify that the website is not displaying pages – executive LinkedIn profiles remain unchanged and the 800 sales number still gives a PBX recording. 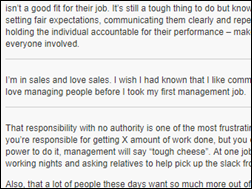 I’ve emailed CEO Tim Roche without a response so far. From Communal Well: “Re: pricing transparency. Do you know of any health systems that have taken action on CMS’s FY19 rule requiring them to publish standard prices on the Internet? 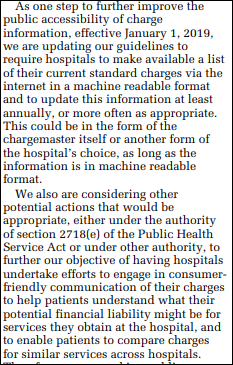 Do patients understand that charges aren’t the same as patient responsibility?” I don’t think CMS-1694-P has been approved yet and won’t take effect until January 1, 2019 in any case, so I doubt hospitals have done anything. It would require them to publicly post their charge masters, which sounds good only to clueless folks who think CDM prices mean something or that consumers can make constructive use of the information. 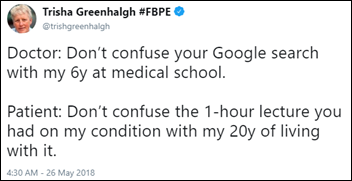 Hospital charge masters are mostly indecipherable to the public, aren’t relevant to what a given patient or their insurance company will pay, and are not very useful for comparing prices among competitors. The proposed rule also won’t address the ever-increasing problem of hospitals contracting with doctors (ED, anesthesia, radiology, etc.) without requiring them to accept the same insurances, sticking patients with unexpected out-of-network charges from an in-network visit. I’m still not convinced that providers shouldn’t be forced to offer the same published price to any willing party rather than conducting secret negotiations with every insurer. From OneHITwonder: “Re: Practice Fusion. 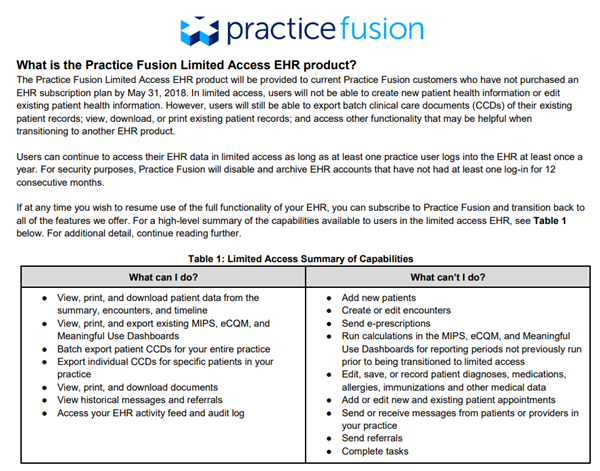 I created an account many moons ago just to see what all the fuss was about (I’m not even a physician) and received this today.” Practice Fusion users who don’t sign up for a paid plan by June 1, 2018 will be switched to a view-only mode, with their only option being to view, download, or print their patient records. The monthly cost is $99 for a one-clinician practice, which includes three secondary licenses (for clinicians who don’t submit claims) and an unlimited number of unlicensed staff. The Allscripts-owned company says subscribers will get new features such as 2018 MU, MIPS, and ECQM dashboards; enhanced reporting; e-prescribing of controlled substances; and advanced QI tools. From WebinAren’t: “Re: webinars. Do people still watch them? Some sites don’t get many participants.” We get a good number of registrants in those cases where the presenter listens to my suggestions about a choosing a broadly interesting and non-pitchy topic, a snappy title, a concise write-up, good speakers (preferably not all from the vendor side), and a sign-up form that contains few required fields. I postulate that the no-show rate, at least in our case, is because registrants know we post the full webinar on YouTube for any-time, any-place viewing afterward. Most of our webinars have had at least 200 YouTube views (some have thousands) and our channel has more than 500 subscribers, so some folks certainly are participating. Most poll respondents think Cerner was the VA’s best choice, but they would have advised the VA to wait to see how the DoD’s rollout goes before signing a contract. Cosmos says it’s going to be hard and expensive for the VA and DoD to be simultaneously competing for experts from Cerner and consulting firms, while Matthew Holt thinks it’s the worst time to be buying an EHR because lipsticked, non-cloud based products will be passé in the next 5-10 years and waiting it out on VistA would have been smarter. This week’s question is timely. I’m all ears. 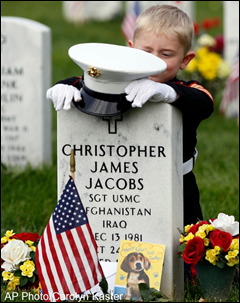 Monday is Memorial Day, set aside to honor those one million US Armed Forces members who died while serving, many of them teenagers whose parents never got to see them grow up. Their sacrifice allows you the luxury of having a fun-filled long weekend free of contemplating that it was made possible by those who made the ultimate sacrifice on your behalf or feeling empathy for the families who experienced their loss, but it would be nice if you did anyway. I’ve always wanted an HIStalk theme song like those of podcasts and radio shows, so I was happy that Max Yme wrote and performed a masterful prog rock instrumental for me. You can stream it from the player widget in the right margin of this page or from your player here if you’re in need of background music while reading. June 12 (Tuesday) 2:00 ET. “Blockchain in Healthcare: Why It Matters.” Sponsor: Quest Diagnostics. Presenter: Lidia Fonseca, CIO, Quest Diagnostics. Blockchain technology is gaining traction in many industries, including healthcare. It’s not only a hot topic, but is also showing promise with real-world applications. This webinar will share how blockchain may play a key role in the future of healthcare IT by helping to solve some of the industry’s challenges, distinguishing the hype from reality by discussing how it works, how it can impact healthcare providers, and its future application in healthcare IT. Memorial Hospital (IL) has gone live with Cerner supply chain management. Frio Regional Hospital (TX) will switch from Evident to Athenahealth. Mary Washington Healthcare (VA) will go live on Epic June 2, replacing Cerner. Maine’s HealthInfoNet promotes acting CEO Shaun Alfreds to the permanent position. You will have to decide if this Politico article is a feel-good story or a depressing look at our healthcare system. A tiny, remote Kansas town turns its struggling hospital into the county’s largest employer after boosting its profitable OB business by recruiting young doctors, obtaining grants to upgrade equipment, and adding luxury birthing suites that took business away from hospitals in neighboring counties. Macroeconomically speaking, is a growing, high-employing health system a positive contributor to a given region? California’s medical board threatens to rescind the medical license of a 75-year-old Stanford-trained MD and homeopathic doctor who sells $5 “ERemedies,’ prescribed 13-second-long “hissing sounds” that he claims cured 36 of 37 people with malaria within four hours. This is a great tweet. As one who has done several Webinars on HISTalk, I would suggest readers send Mr. H their thoughts on what topics they would like to hear addressed…or maybe HISTalk do a survey of possible topics. Re: ambulance chasers getting technical. 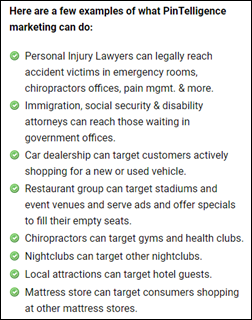 From my understanding, they are just using the advertising IDs of those folks detected to have been in a certain area to show them additional targeted advertisements. The vendor doesn’t have to get it right 100% of the time for it to be an improvement over random web ads. The three headed dog guarding hell and the name of the holding company for Steward Health Care is Cerberus, rather than Cereberus. Thought you’d want to know. Thanks. I noticed that the Boston Globe got a couple of comments about the company’s name, which the company’s founder apparently initially thought was clever but now regrets. Cerberus also owned Chrysler for awhile. Between Diamler & Fiat. 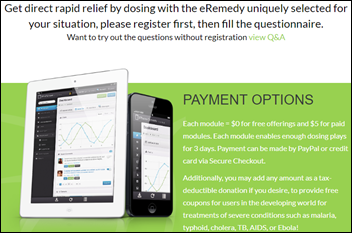 This little EHR is often dismissed out of hand because it’s free and shows drug ads. I’ve used it in my small primary care office for about 4 years and actually kind of like it (and I’m not a noob; I’ve used EHRs for over 20 years including Epic for 7). It’s a little clunky in some areas, very slick in others, but the great thing about it is that it’s continually improving. Someone there really cares about users and keeps making the little refinements that make the physician’s day easier. Hopefully, whoever they are, they’ll stick around after the Allscripts acquisition! We’re paying the $100/provider/month for now and we’ll see how it goes. PS. I have no connection to or vested interest either PF or Allscripts. One of these days, I thought Mr. HIStalk would adopt a more jazz- or jazz-fusion- sounding theme song because the site is so very cool. But knowing Mr. HIStalk’s love of progressive rock, I think Maz Yme’s instrumental fits the bill nicely! I always hear the Dr. Who theme music in my head when I’m on HIStalk. We don’t really know much about him, he’s got some great companions, and it’s always an adventure. Steward is one reason I have no faith in what leadership has to say. So they have Epic. Every other “big name” in Boston now uses Epic. I know records are sent through CareEverywhere to many/most of them. 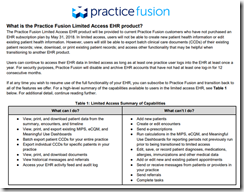 I’ve seen them myself and they integrate well into the EHR. I am not up on every link in town – but if Steward is not connected, it’s a leadership issue, and not a technology one. But heck – easy to blame the technology, rather than the leadership who chose to spend billions on Epic in the Boston area and still not be integrated. Personally, I have had to fight with a “big gun” in the area to get an out of network test (or wait 3 weeks for their center), when my elderly parent was in the same situation they would have no idea and just wait 3 weeks. This is not limited to Steward. Steward doesn’t use Epic. I think they are on Meditech in their Massachusetts hospitals, at least some of them anyway. Steward is larger than I realized — four hospitals in AZ, one in AK, three in FL, one in LA, three in OH, two in PA, six in TX, five in UT, and two in Malta. Re: Mr. HIStalk – remember, Steward merged with IASIS Healthcare around October of last year, which is why they are much bigger than you anticipated. You are correct, Steward is mostly MEDITECH while IASIS is Cerner Millennium.